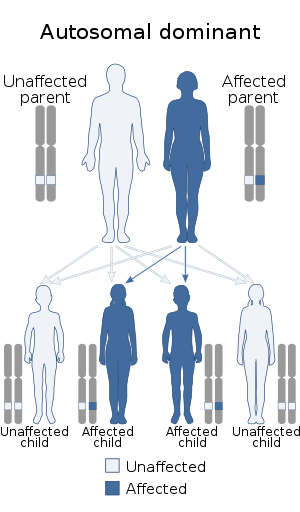 This condition can be inherited in an autosomal dominant manner. Goldenhar syndrome (also known as oculo-auriculo-vertebral (OAV) syndrome) is a rare congenital defect characterized by incomplete development of the ear, nose, soft palate, lip and mandible. It is associated with anomalous development of the first branchial arch and second branchial arch. Common clinical manifestations include limbal dermoids, preauricular skin tags and strabismus. The term is sometimes used interchangeably with hemifacial microsomia, although this definition is usually reserved for cases without internal organ and vertebrae disruption. It affects between 1 in 3,500 and 1 in 5,600 live births, with a male-to-female ratio of 3:2. Chief markers of Goldenhar syndrome are incomplete development of the ear, nose, soft palate, lip, and mandible on usually one side of the body. Additionally, some patients will have growing issues with internal organs, especially heart, kidneys and lungs. Typically, the organ will either not be present on one side or will be underdeveloped. Note that while it is more usual for there to be problems on only one side, it has been known for defects to occur bilaterally (approximate incidence 10% of confirmed GS cases). Other problems can include severe scoliosis (twisting of the vertebrae), limbal dermoids and hearing loss (see hearing loss with craniofacial syndromes), and deafness or blindness in one or both ears/eyes. Granulosa cell tumors may be associated as well. The cause of Goldenhar syndrome is largely unknown. However, it is thought to be multifactorial, although there may be a genetic component, which would account for certain familial patterns. It has been suggested that there is a branchial arch development issue late in the first trimester. An increase in Goldenhar syndrome in the children of Gulf War veterans has been suggested, but the difference was shown to be statistically insignificant. Diagnosis is based on clinical features. General features include unilateral facial asymmetry. Ocular abnormalities include limbal dermoids, strabismus. Otorhinolaryngological features include microtia, partial to complete atresia of external acoustic meatus, preauricular skin tags, deafness, macrosomia. Skeletal abnormalities include mandibular deformities, scoliosis. Other organ abnormalities include cardiac defects and renal abnormalities. Treatment is usually confined to such surgical intervention as may be necessary to help the child to develop e.g. jaw distraction/bone grafts, ocular dermoid debulking (see below), repairing cleft palate/lip, repairing heart malformations or spinal surgery. Some patients with Goldenhar syndrome will require assistance as they grow by means of hearing aids or glasses. Stem cell grafting (womb tissue grafting) has been successfully used to "reprogram" eye dermoids, effectively halting the regrowth of eye dermoids. These tissues that grow on the eye are "mis-programmed" cells (sometimes tooth or nail cells instead of eye cells). Prevalence ranges from 1 in 3,500 to 5,600 live births. Male-female ratio is found to be 3:2. The condition was documented in 1952 by Belgian ophthalmologist Maurice Goldenhar (1924–2001). ^ Touliatou V, Fryssira H, Mavrou A, Kanavakis E, Kitsiou-Tzeli S (2006). "Clinical manifestations in 17 Greek patients with Goldenhar syndrome". Genet. Couns. 17 (3): 359–70. PMID 17100205. ^ Araneta MR, Moore CA, Olney RS, et al. (1997). "Goldenhar syndrome among infants born in military hospitals to Gulf War veterans". Teratology. 56 (4): 244–251. doi:10.1002/(SICI)1096-9926(199710)56:4<244::AID-TERA3>3.0.CO;2-Z. PMID 9408975. ^ Kokavec, R (September 2006). "Goldenhar syndrome with various clinical manifestations". The Cleft Palate-Craniofacial Journal. 43 (5): 628–34. doi:10.1597/05-094. PMID 16986988. ^ synd/2300 at Who Named It? ^ M. Goldenhar. Associations malformatives de l’oeil et de l’oreille, en particulier le syndrome dermoïde epibulbaire-appendices auriculaires-fistula auris congenita et ses relations avec la dysostose mandibulo-faciale. Journal de génétique humaine, Genève, 1952, 1: 243-282. This page was last edited on 13 July 2018, at 05:37 (UTC).